Jigging on a river for trout, to me, is casting and retrieving, working the lure, and picking the water apart. It's being in tune with the bottom and the flow. It's like a combination of drifting a fly and plug fishing. It's part dead drift, part swing, and part mimicking life and action. A good jig rod is lightweight and able to cast and feel tiny lures, but strong enough, stiff enough to be able to set the hook and fight. It needs to be limber, but not anywhere near floppy. It should be able to cast a 1/32nd ounce lure and fish about 2 to 6lb line. I want enough length for some reach, but not so long that its cumbersome to work the jig. Exact length is least important to me - but I want longer when wading big water and shorter when in a boat or on small water. you aren't limited to only the reach of your rod. A cast can be made across current to reach a seam or pocket. Then the length of the rod bridges the line between tip and where the line enters the water. The higher the reach, the less drag. Length, within reason, equals control. Without the drag, the jig stays put longer, much like the fly. This could be for the presentation itself, or it could be to achieve the depth needed before allowing the jig to swing downstream along the current seam. A longer rod gives greater reach, and a steeper angle between rod tip and lure. Again, length equals control. This is even more pronounced when fishing a jig float-n-fly method - where the jig is suspended under a float (similar to a nymph under an indicator). 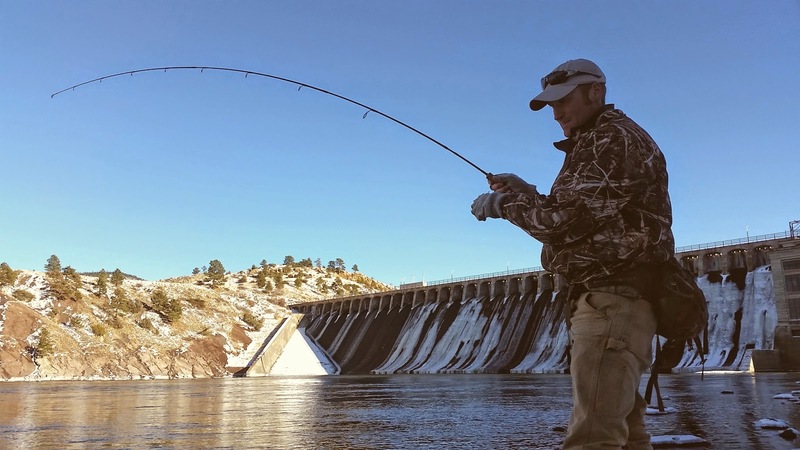 Often you can lift your line off the water entirely so that your rod tip is connected directly to the float, bridging all water, current, and obstacles between you and your lure. A long, limber rod has other benefits as well, a primary one being the enhanced ability to use light line. After 'discovering' the long rod while fishing the streams of the Northwest I efficiently fought and landed numerous small-stream steelhead on four pound line. Light line has many advantages – invisibility, castability, lure action and presentation, reaching bottom quickly, etc. All of which benefit jigs greatly. But it has obvious disadvantages too – breakage on the hookset, breakage during a strong run, abrasion on teeth or structure, too long of a fight prior to release, etc. I’ve spoken with many anglers who contend that big fish can’t be landed - at least consistently - on light line. But that doesn’t explain the countless heavy fish landed on tiny fly tippets every day. 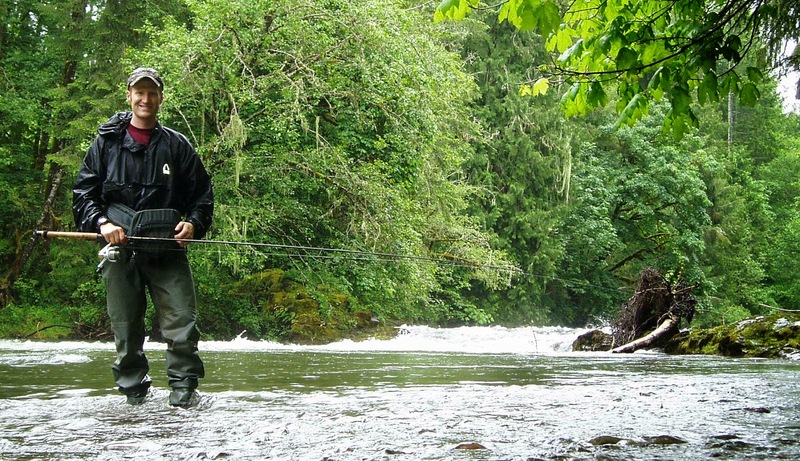 It doesn’t explain the Northwest anglers netting salmon and steelhead in small streams every year. Of course a 15-pound fish can be landed with 4-pound line on a 5-foot rod – it happens all the time. My son and I landed a carp like that on his kiddie rod with two eyelets and a non-existent drag. But the angler with a long rod has a much greater degree of control during that fight, and his chances of landing the fish, in my opinion, are much greater. And in a timely manner. 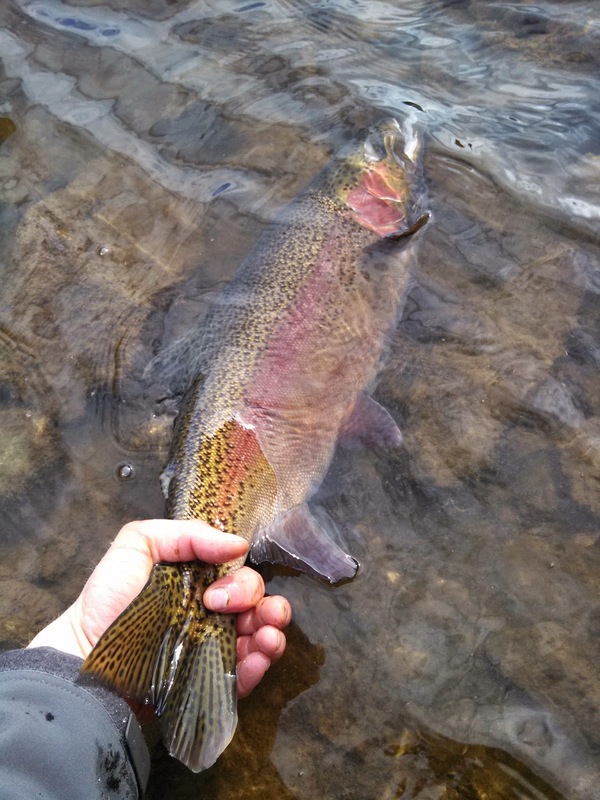 I’ve caught steelhead and big trout on 5.5-t o 6-foot rods and light line, but, unless the lure presentation requires a short rod, I’d rather have a 9 or 10 footer in hand if given the option ahead of time. Lighter lines aren’t fully capable handling the shock of a big fish on their own. This was demonstrated plainly and uniquely to me once in Florida during the after-midnight hours while tarpon “jumping” with a random angler I’d met earlier in the day when flipping plastic worms to lily pads for largemouth. This guy would go out on bridges in the wee hours of the morning and swim large single-hooked, barbless jigs on heavy gear along the shadow line created by the bridge lights. Maybe it is big sport down there, maybe he was alone in his pastime, I really don’t know. The goal was to hook tarpon, let them go ballistic, and then shake the hook out without landing it. He used a “shock” leader – a heavy piece of monofilament (as in maybe 100-150 lb test) for the first several feet, then something like 50 or 80-lb on the spool. I’m sure this is common in salt water big game fish, but it was new to me. To me a leader usually goes the other way – connecting a heavier line to a lure/fly via a lighter, less visible line. That night only brought action from one tarpon, but I’ll never forget the refrigerator-sized fish that launched itself out of the black water into the glow of the street light to nail that lure as it was rising to meet the surface. I could see how the sheer power of that hit would likely have blasted through that 80-lb line as if it were a strand of spider web. The man I was fishing with explained how without the leader the line often breaks just from being battered by the powerful body during the fight - at least with his unforgiving style perched on a bridge with a stout rod. 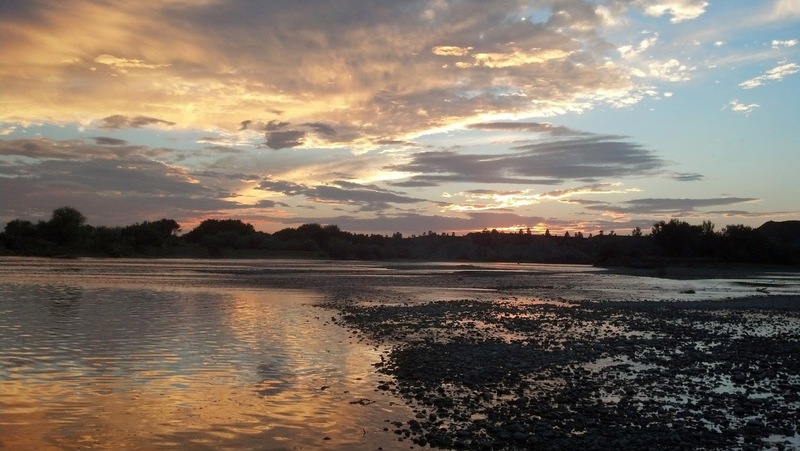 Back in a trout stream or steelhead river my tarpon experience seems hardly applicable. I suppose the lesson is simply in the shock a big fish can impart. Lighter lines can benefit from some help when battling big fish. Much of that help comes from an angler's skill and experience, as well as the quality of the reel's drag system, but also from other tools used. For the tarpon, that was the buffer of a shock leader. For salmonoids, I feel like a long rod is one of the best tools to make fishing a light line most feasible. I have no measured statistics, but a long limber rod must absorb a great deal more shock than a shorter one. Combine a long rod with a good drag, and a light line is practically unbreakable. I even find myself palming my spool, same as I would a fly reel. With more control supplied by the rod, the drag can be set more loosely, and custom adjustments made with pressure from the hand in direct response to whatever the fish is doing. Runs can be more quickly stifled and the fish more effectively turned or steered. And then in the other direction, when a fish jumps or turns and the line would normally go slack, the deep bend of the rod helps maintain tension as it begins to unload before your reel can catch back up. The line is more gently loaded and unloaded, which translates into less shock. Even the shock of the hookset is tempered a bit, which I think is more beneficial than not. It reduces the chance of breaking off in that moment, and I don't find I that need to compensate for what seems like a softer hookset. My theory is that because of the rod length, the tip travels a far greater distance with the same hookset motion made on a short rod, so despite the "softer" or less rigid hookset, it has still been done adequately, with all the same power, and perhaps even more evenly in that the rod has been well-loaded with a deep bend, alleviating the need to "catch up" and reel down to the a fighting position. How often have you seen someone make a hookset and then lose the fish as they try to bring their rod back down out of the air, reeling wildly to gain back all the line their overzealous jerk created. A long rod does this in one motion - the rod goes back for the set, bows deeply and stays arced, and then the fight can begin from that point as the blank unloads the tension. 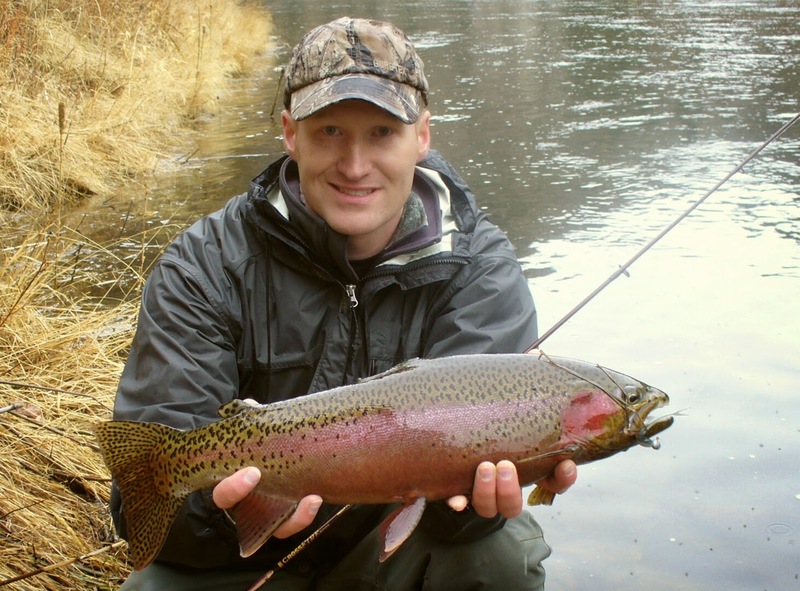 The longer length also allows for the fish to be landed and released more quickly than on a shorter rod. The fight is more in the angler's court, where with the shorter rod the fisherman is much more dependent on the reel's drag alone, and will lose much more line and much more time to runs and surges. This same advantage is well portrayed by tenkara fly rods (which is described well here by Gink and Gasoline). Even if you've never used one, or never had the surprise of tying into a bass while fishing for bluegill with a cane pole, imagine trying to fight a sizeable fish with the line tied to your finger tip versus fighting that same fish on a line tied to the end of a long, limber rod. Pretty easy to visualize which one is more in the fisherman's favor. 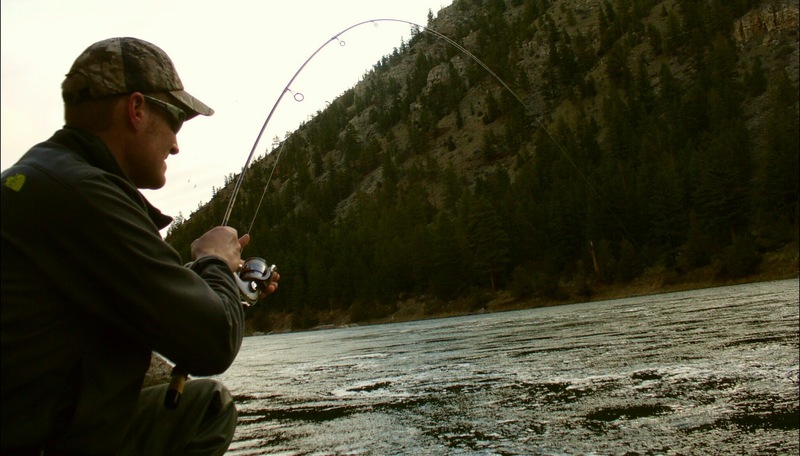 Aside from its forgiving qualities, during the fight the long rod helps reach over logs and rocks your line might have been raked across with a shorter rod, and it helps you reach over streamside bushes when a jog downstream becomes necessary. Fly fisherman already utilize all this, even if just by default of having a long rod in their hands already for the purpose of making more efficient casts. As a fly fisherman, I love to fight fish on a longer rod. I did right from the beginning, and I’ve been doing it most of my life. But until I got the Northwest and was introduced to long spinning rods, it never occurred to me that the same advantages were available to spinning gear. Before then, a long spinning rod to me was 7 feet. And in my little world, they tended to get heavier as they got longer. When I used spinning gear for trout before leaving the South, my rod was often only 5 feet long. Sometimes when I was fishing jigs I'd bring a 6-footer I might normally use for smallmouth bass jigs. Rod length is less important from a boat, where you are already elevated above the water and more likely to maneuver yourself closer to your target. It is also less important on smaller streams where the scale of everything you are doing is simply smaller, coupled with the fact that you can often gain additional height from the bank or some obstacle in the stream. The exception being when conditions are such that there is less of a cast and more of a "hold over and drop," like along extremely brushy streams, or when you are reaching horizontally over structure, such as a vertical stream bank. My boat rods are 5.5 to 6.5 feet. My small stream rods range on up to 7 (and occasionally up to 9.5). Typically I outfit folks with the 5.5 or 6 foot rod lengths, although I do keep at least two "loaner" 9.5 foot rods in my tubes for those folks who'd like to give one a go. I find generally that people fishing with me who aren't jig fisherman already have a better command of shorter rods, and it's just best to start with what you know. Especially in the confined space of a boat. For myself, while in the boat, I'll fish plugs on the shorter rods (because my retrieve is mostly done with tip down) and toss jigs on the 6 and 6.5 foot rods - often my Crossfire. The Crossfire makes an excellent boat road for working jigs, and was developed especially for that purpose. It is also often my second rod when walking along and wading big water - I generally keep one holstered behind me while using the other, each with a different purpose. in my backpack for hikes. Diawas's Spincast is under $50 and feels far more quality than that. It comes is lengths from 5.5ft to 7ft. For those a bit more performance driven, the Presso is just a step up and runs about $80. There's a lot of value and performance stuffed into those rods, and they are among very few spinning rods (particularly light spinning rods) that come in four sections. Many come in three, which to me, just isn't very handy in terms of packability. I have multiple fly rods that come in four pieces. In fact, it is the norm these days for a fly rod to be offered in four sections. Maybe the rest of the industry will catch on. Fenwick has a 7-footer that comes in four pieces, and Okuma has one as well. I haven't tried either. Now that said, I LOVE a one-piece rod. Many of my rods, including the Crossfire and an array of others, are single piece. You can't beat a continuous blank when it comes to sensitivity and power. And it's superior in terms of maintenance and durability - no ferrules to crack, no sockets to fill with dirt, no casted off rod tips, no eyelets out of alignment, no second thoughts on a powerful hookset or hang up. When possible, I use my one piece rods. The rest of the time, which is a considerable amount, I want my rod to be as packable as possible. Any rod can be a jig rod, but like any fishing situation, you will get far more out of your gear and your day on the water if you match your gear to the presentation you are trying to make. Far too many people try to match their gear to the fish they are hoping to catch, or load their spools with a heavy line because they don't want to break off. Start with the lure you are going to toss and the presentation you are going to make, then work backwards from there, choosing the best line to match it, the best rod for that line, lure, and presentation, and then the most appropriate reel for that line weight. The fish, regardless of size, can be landed on just about any set up - but you have to hook it first. Fish the right gear and you will greatly increase your chances of that.